Whether you are new to system administration or have spent some time in the role, getting a grip on documentation can be tricky and often times challenging. I can speak from experience because when I started my career I had no idea how to do this stuff, but slowly over time I have been able to develop some useful techniques. It also helps that I am obsessed with documentation. Therefore the techniques I use are always changing and I am always looking for ways to improve my documentation skills. I think the most important take away from what I have learned, is that there is no end all be all way to do documentation and everybody will probably find slightly different ways. My method may or may not work for you but hopefully you can look at it and use some of the underlying concepts to help with your own style. I have been able to use my own documentation procedures over the past 3 years to really improve my job performance as well as other areas in my job so hopefully there is something in here you can apply to your own situation. Once you get past the initial stage of how uncomfortable it is to document everything by your mindset to how useful it is to having a living reference for everything on the network, then documentation really becomes much more manageable. The added bonus of solid documentation is that once you have a decent repository built up you don’t have to worry about constantly adding new items to your documentation. I am at a point now that I primarily use my documentation as a reference and don’t find myself having to create or update things nearly as often as I used to. The other main benefit of having solid documentation is to help others on your team, especially junior members so they can go out and learn about certain intricacies or specific details of systems in your environment. It’s also good for avoiding situations like the hit by a bus scenarios. The general idea is that by having a great piece of documentation, somebody can pick up where you left of with minimal downtime and impact. Hence, if you were to get hit by a bus and/or become incapacitated then somebody else could get up to speed with the way things work (what, when, why, how) using your documentation as a reference without having to spend hours and hours of time to figure out what exact information that they needed to know. There are really two main types of internal documentation, internal and external. Public facing (external) documentation is an entirely separate topic and I will not be discussing it here. Network and technical documentation (internal) are the two big ones that I use to reference typically. Network documentation is essentially working with Visio to produce anything and everything related to the network. If you want to be a good system/network administrator a great way to help is to get good at working with Visio. The other type of documentation I like to refer to as “technical documentation” is typically anything and everything that I have found to be helpful in solving a problem. As I mentioned earlier, the longer your work on your environment and building your documentation the less you will have to produce new documentation. This information comes from the documentation section in Limoncelli’s book Time Management for System Administrators which is a fantastic book for sysadmins if you haven’t already taken a look. My own technical documentation has grown organically in the 3 years, from just a few pieces of information to essentially a living library of all of the different systems I and others on my team work with on a regular basis. Everything I do is in there; from technical procedures, links to external blogs and websites, PDF’s, to pretty much anything else you can imagine that would be useful. One of the hardest things about working on documentation in a collaborative environment is getting people to buy in to the system. The best way I have found to handle this is to take the initiative, start the process and then let everyone know about it what tools you are using and how awesome this documentation is and hope that it sticks. I am not a fan of forcing people to do things but by showing them an amazingly simple system that is also incredibly useful the goal is to get them excited and motivated to use your documentation system. Sometimes it works, sometimes not, but I have found it to be the best approach when attempting to change people’s habits and get them used to working with something new. In the remainder of this post I will go into some of the details of how I organize my technical documentation and use it to help quickly identify and fix problems quickly. I don’t plan on covering network documentation in this post as it is a slightly different beast. I have used pretty much every documentation system you can think of, from SharePoint, EverNote, Dropbox, various Wiki’s, Office documents, etc. and through my time and experience with all of these various tools I have found one to be the best for syadmin documentation. I really believe that many of these tools serve a certain purpose or function but in my time as a sysadmin I have found OneNote to be the hands down best tools for system administration documentation. As a side note, Wiki’s are a great alternative if you don’t have access to OneNote but my preference lies with OneNote. OneNote is flexible, you can set up a location on a file share inside your company and allow access by certain AD users or groups to the share to control who can see and write to and collaborate on your documentation system. It is very handy to be able to work on some notes while in a meeting on my laptop then move back to my desktop and have these notes current and in sync between my machines. It is also possible for multiple people to be in OneNote working live on different notes, which is also nice when you are working in a busy team environment. I know there are many other products that allow this so even if you don’t choose OneNote I would highly recommend a tool that offers these features. I have OneNote grouped in a specific way to help increase my productivity. I have different notebooks for various items. I have a notebook for my technical documentation, a task log, one for projects and meetings that eventually get merged into my tech docs if they grow and the project/meeting ever materializes into anything more than just a few notes and I also have a notebook for personal work items. The personal notebook contains a few different notes for personal accomplishments, personal agenda and ideas for projects and improvement. Within the tech docs notebook I have notes for all of the major technologies that I or members of my team work with on a regular basis. Basically, anything that we deem noteworthy gets thrown into one of the categories somewhere inside the tech doc. The structure of this document grows organically for me with a few minor pain points here and there along the way. For example, when a new solution to a problem is found and there isn’t a specific category for the fix, sometimes it is necessary to either create a new category or just use your judgement when determining the best place to store the fix. Luckily the search feature in OneNote works well so if you can’t remember where you put something then you can just search through everything to find it. Coincidentally, the larger your docs grow to be the better the search function works. Network Information – IP’s, DNS names, server and network roles, anything that plany a part in the network goes here. Support/Contact – Direct software and product support numbers, vendor contacts, important email addresses, account ID’s and service agreements, licenses, contract numbers, etc. Resources – Any links to relevant and important technical docs, deployment guides, implementation guide or admin docs that are either internally or online. 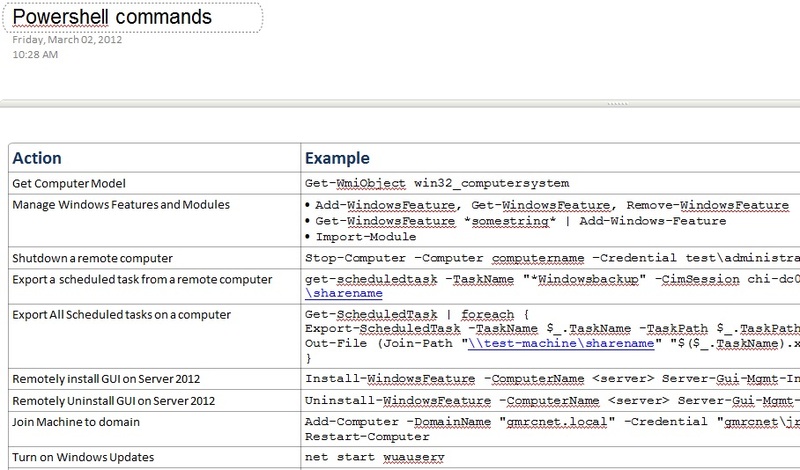 Commands – I work in a Windows environment so often times PowerShell is the go to resource. I keep a table of all the commands that I deem to be useful here for that particular category. Useful tools – This one is optional but for some categories is a nice little reference. I use this section to help identify anything and everything that I can use as a tool to help with a particular category. This information is the skeleton that I begin to model all of the other documentation around. From there, the rest is easy and should essentially fall into place. Most of the time for me, these other items are one off fixes for problems that I have found or have solved. Sometimes a quick link to the blog post that helped will be a good enough reference and other times a painfully detailed set of steps is necessary for documenting the procedure for the fix. The actual documentation is more of an art form than anything else that gets better with practice. Sometimes technical notes require an obscene amount of detail because of how complex they are and because the procedure only needs to take place once or twice in a year. Other notes just need a rough explanation and therefore don’t need any detail at all, it all depends on the situation. As has been pointed out in the comments section, one good approach to documentation sometimes is to assume the reader has no prior knowledge about the topic and therefore painful explanation and detail are necessary to convey your materials. The point is, there is no cookie cutter way to do all of your technical documentation and various tactics and techniques need to be developed for different types of issues, that is why documentation becomes an art form in my view. Going back to my own technique, one of the most helpful tricks I have found is to create the commands section, which I throw all of the most useful and common commands into for the particular category I am referencing. The more work you do from the command line, the more useful this note will be to you. For example, being in a Windows environment, I work with Exchange pretty much daily and having a repository of all the useful commands that I need in one place is one of the best ways to save time rather then going through Google looking for the specific information I am looking for every time. Here is a glimpse of what I am talking about. Another thing that will help your documentation immensely is consistency. I am talking broadly here but when you create a living document you will want to have some sort of consistent style across your documentation. Items that come to mind here are things like having a consistent template as mentioned earlier, consistent naming conventions, fonts, naming conventions, established criteria for creating topics and notes, capitalization, fonts and organization, etc. Having this general style guide established early on will help to make finding and reading information in your documents much easier and will consequently help to save time when you are looking for specific information. That’s all I’ve got for now. I just wanted to point out a few things and get people pointed in the right direction that are looking for ideas of how to get going on technical documentation. As I mentioned, there’s more than one way to skin a cat – meaning there are a large number of ways to do documentation and there isn’t necessarily one best way to do things. I have shown you my preferred way, but it may not be the best way for you. Documentation is as much of a learning process as anything else and sometimes you just need to experiment with things and just spend some time wading around to get the best results. One great way to check if your documentation is working or not is to get somebody from your team to attempt to use your documentation to fix something you have instructions for. If you just want to get some practice writing clear and concise instructions, try this method on yourself. Write out the doc and procedure and come back to the instructions a week or month later and see how hard it is to figure out how to fix the problem. Chances are, if things are unclear or your teammate is unable to fix the issue then it is probably a good idea to take a look at reevaluating how you’re doing your documentation. If you have any thoughts, suggestions, ideas or anything else just let me know. Like I said earlier, I am obsessed with this kind of stuff and I am always looking for ways to improve my own processes and procedures. I plan on coming back to this post and update it in the future if any of my documentation practices change but for the time being, I hope you find this information useful and applicable to your own documentation processes.